A safe custom-made stone American mailbox, far from the troubles of our man in Europe. Photo courtesy of Premiere Quality Masonry. Our European correspondent Mike Alexander tells of his ongoing battle with a local carrier for the French postal service. The postman (facteur in French) careening around the countryside in his little yellow van is ubiquitous in France, much more a part of culture here than the stereotypical Frenchman in a beret smoking Gauloises cigarettes. Where I garden, the postman has a strict policy of never getting out of his van unless absolutely necessary. He veers from one side of the road to the other bouncing up curbs and over sidewalks then stretching through his window to toss the day’s mail into its respective box. He will do anything to avoid getting out of that car. In fact, one might be forgiven for thinking that he is part of a government disability program; the unfortunate victim of some industrial accident involving a runaway locomotive perhaps or something even more terrible that has left him minus a leg or two. That illusion is dispelled come the month of December. Suddenly, our paraplegic Mad Max turns into a different man. He leaps from the van in sprightly fashion and marches up the driveway with the mail tucked under one arm, reaching out to offer me a warm handshake with the other and greeting me as though we have been sharing a beer or two together everyday for years. Hidden inside the mail is a small pile of cheap calendars plastered with the French national postal logo and a choice of photos, many of which bear little resemblance to anything French: a mountain in the Himalayas or a gazelle somewhere in Africa and, of course, several cute little kittens. The primary function of this calendar is not to mark off the days of the week or passage of the months. It is intended as an “aide de memoir.” In other words, a not-so-gentle reminder that Christmas is approaching and, in case you hadn’t noticed, the non-stop stream of advertising on your television and the larger-than0normal quantities of junk mail appearing in your mailbox. Ostensibly, the calendar is a gift from the post office to you, their wonderful customer. In reality it is a subtle warning that now would be a good time to make a small donation to the annual Christmas party, unless you want to find your mail being accidentally delivered to some remote village high in the Pyrenees Mountains or worse, to the next door neighbor’s Rottweiler. I have no problem with the system. My own facteur drew the short straw and gets to ride around my village on a rickety scooter in all types of weathe,r so I feel he deserves whatever he can squeeze out of us. Toward the bearer of post on the estate however, our semi paraplegic kamikaze driver, I hold different feelings altogether. Technically he and I are at war and this Christmas truce is just an uneasy and temporary affair. In this part of France, the Iris thrives despite the shallow soil and harsh climatic conditions. It was the flower of the Royal standard in France until the French revolution. At that point, it went decidedly out of fashion because of its close association with royalty and even being seen with one embroidered onto your clothing could result in a quick trip to the guillotine. Many cathedrals and ancient government buildings still bear bald spots in their stone work where beautiful “Fleur de lis” motifs where chipped away by zealous revolutionaries. Today, the anti-iris fanaticism has faded away and once again these useful garden plants are widely enjoyed. 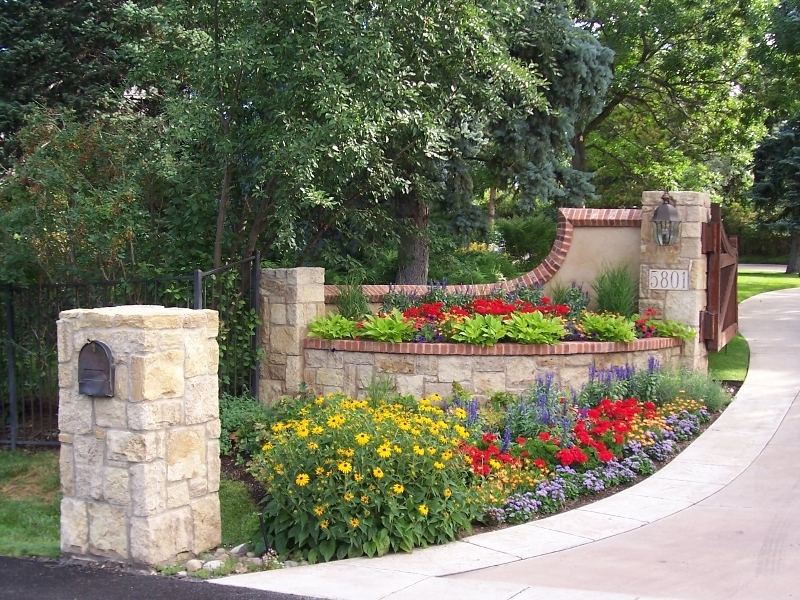 I love to plant at the base of the stone boundary walls surrounding the estate. The conditions at the foot of these walls are always dry and virtually devoid of soil and for a few short weeks each spring these hardy plants put on a stunning purple display highlighted against the ancient stonework, where few other plants would even survive. However this means that the facteur is obliged to either get out of his van to get to the mailbox or drive over my plants. In the beginning, he chose the latter option. He might as well have just nailed a sign to the wall saying “War Declared.” As soon as I saw the vehicle tracks through the narrow bed I set to work collecting barrow loads of rocks, something there is no shortage of in this part of France. I used them to set out a neat boundary to my garden beds. It’s just subtle enough not to draw the eye away from the plants, yet formidable enough to rip the bottom out of any small van that should deliberately attempt to drive over them. For the moment, the truce holds but, I suspect, only until the end of the festive season when hostilities will be renewed…by both sides. This entry was posted in Flowers, Garden, Uncategorized and tagged flowers, France, French, garden, gardening, Iris. Bookmark the permalink.